The Atalanta: From Myth To Modern Classic CarThe Atalanta, a British classic car had all but vanished from our roads. Read on to discover how a team of craftsmen are reviving the car and the brand. It’s a case of reality mirroring mythology as we anticipate the comeback of the Atalanta sports car. With just 22 originals built before the manufacturer was forced to cease operations to join the war effort in 1939, the marque had all but disappeared...until now. From the Greek word ‘atalantos’, meaning ‘of equal weight’, Atalanta Motors is once again providing that perfect balance between fun and practicality, character and technology in one beautifully packaged, tailor-made British classic car, in the style of its 22 ancestors. Far from an attempt to rebuild the original model, the new Atalanta is an evolution of what was one of the most technically advanced cars of its time. The Olympic heroine who shares the same name was also abandoned before she had reached her full potential. The myth tells how, left alone in an Arcadian forest by her father, Atalanta was adopted by bears and cultivated into a strong warrior. 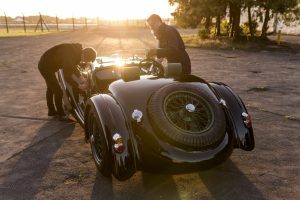 In the same way, Atalanta Motors has been re-discovered and nurtured to become a resilient, modern, vintage-style car brand by new MD Martyn Corfield. Determined to reinstate the brand, he secured the rights to Atalanta Motors and embarked upon recreating this vintage car, incorporating the unrestrained luxury of an era when style very definitely ruled the road, along with the modern safety and reliability features that are so necessary in today’s cars. The resulting new Atalanta has indeed achieved the right balance that will allow those with a passion for motoring to taste today’s engineering excellence along with the unbeatable joy of driving a car that is nothing short of a work of art. 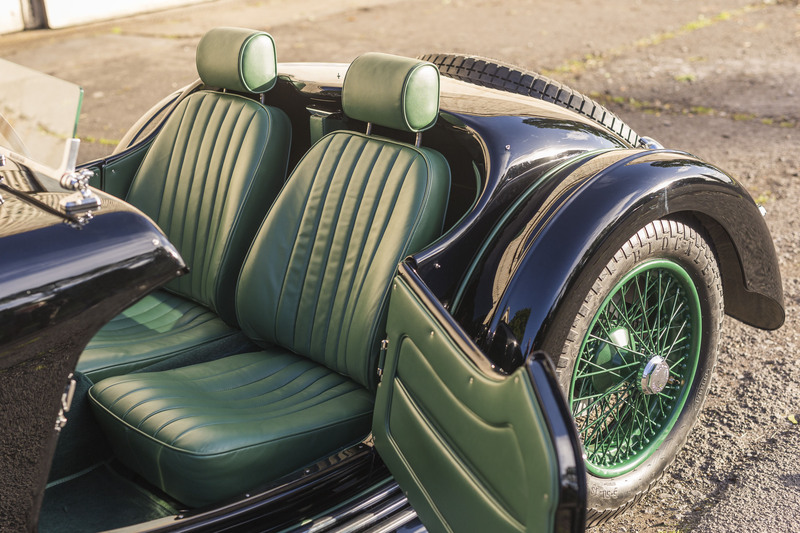 As far as the British classic car goes, the new Atalanta is as unique as they come; each is built to the exact requirements of any fortunate owner. Interior colour and trim can be selected to suit, and adjustments made to the coachwork and cabin to suit personal preferences. Even with this buyer input, the new Atalanta retains all of the authentic, beautifully flowing lines, lightweight coachwork, independent suspension and powerful 4-cylinder engine as the 1936 model but also benefits from nigh on 80 years’ worth of advancements in engineering, safety and comfort. Modern technology is seamlessly incorporated, in the form of hydraulic disc brakes, electrically locked doors, rack and pinion steering, as well as more obvious additions such as headrests, tail lights and indicators (all included to satisfy rigorous Vehicle Approval regulations). Indeed, Atalanta Motors’ team of craftsmen has had the opportunity to demonstrate their own innovative capabilities on each and every part of this vehicle. Aside from the Atalanta enhanced, lightweight 2.5 litre engine, T9 5-speed gearbox and differential, all other parts are bespoke. Some 2500 skilled man hours contribute to each car, warranting the waiting time of around a year. Hand-crafted from scratch, every detail is individually and painstakingly formed; from the decadent leather interior and cabin filled with Art Deco touches, to the laced 18 x 4 Rudge Whitworth-style wire wheels. Everything has been styled to enhance the Atalanta driving experience, including a sympathetically-designed 3-bow ‘get you home’ hood. This shouldn’t be difficult; anyone who encounters the new Atalanta will fall instantly in love, not only with its stunning appearance and driving capabilities but with the historic tale of its revival. As with all mythological creatures, seeing, or in this case, driving is believing. To discover more about Atalanta Motors and enjoy the driving experience of a new British classic car, visit www.atalantamotors.com or call 01869 242200. Copyright © 2017 Atalanta Motors. All Rights Reserved.